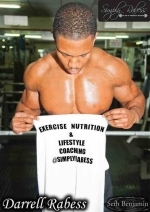 Darrell Rabess, Personal Trainer and Miami Professional World Championship Fitness Model. When Darrell approached me in the gym where I swim, I was struggling with some weights. Though I had been swimming two to three times per week, Reg had told me I needed to get stronger. I was attempting to follow a weight training programme which had been suggested by Reg but did not have enough experience to do this properly. Darrell explained that if I continued the way I was I ran the risk of injury and not getting the best out of the time I spent in the gym. I had a bout of sessions from him to help me prepare for the retake of my Level 1 Training in February. I will be continuing to have sessions with him prior to the race itself.